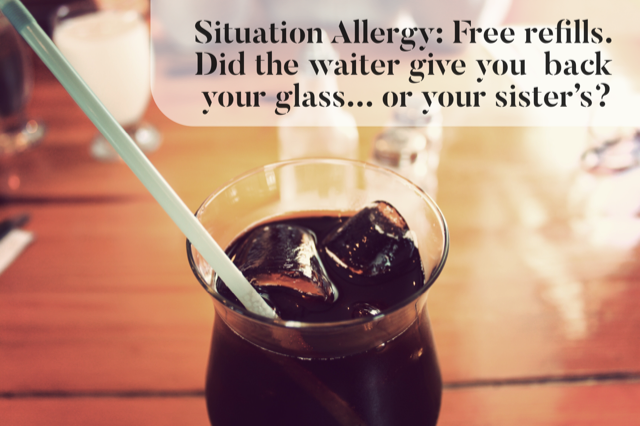 Situation Food Allergy: Does your son still drink the soda? Situation Food Allergy. Does your son still drink the soda? BLOG POST #122 — Your family and a group of friends are enjoying dinner at a busy restaurant. The kids are sitting at one table. The adults are at another. The kids obviously are having fun. Even though the restaurant has been wonderful at accommodating your teen son's dairy and sesame allergies, you still have seated yourself so you can keep an eye on your son's food situation. "Who needs refills on the sodas?" you hear the waiter announce. All the kids raise their hands. You watch as the waiter takes the six glasses and carefully positions them on the tray. You watch him walk over to the server's station and pour soda into each of them. As the waiter returns, he confidently places the glasses in front of each of the kids. You look to your son. You watch your son's eyes scan the glasses at the table. He looks at the glass in front of him, picks it up, and shifts the straw. Does he take a sip? How does he know the waiter returned the correct glass? What do you do?